The DEHNcord type 2 surge arrester (two-pole, single-pole) can be installed into installation systems such as the terminal compartments of flush-mounted systems, end loads and cable ducts. Surge arrester the new DEHNcord from the globally active lightning and surge protection expert DEHN, reliably protects for instance outdoor LED lights from surges caused by lightning interference. Compact in design, DEHNcord can be installed wherever the performance reaches its limits for terminal equipment of a standard type 3 surge protective device. Ensuring surge protection the DEHNcord wherever space is restricted is in line with standards. The standard DEHNcord in accordance is a type 2 surge arrester, it can also be utilized at the transition from Lightning Protection Zone LPZ 0B to 1 or higher. All normative requirements are met with the DEHNcord. The withstand capability of the short-circuit current Isccr of 25 kArms where the mains-side overcurrent protection is required and a total discharge current Itotal of 20 kA (8/20 µs). 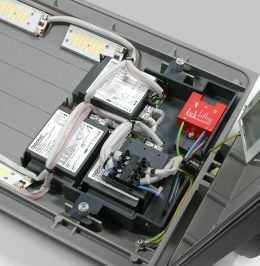 Despite its compact design, the device houses a mechanical operating state / fault indication and a tried and tested disconnector which does not disconnect the connected load as soon as it is tripped. If space is a restriction in the cable duct, the installation benefits of DEHNcord as a result of its flexible terminals become predominantly evident. DEHNcord ideally can adapt seamlessly to existing installation systems. It readly ensures reliable protection of terminal equipment's at a very minimal expense, takes up little space and saves on its installation time.